As a Plano homeowner, mowing your lawn yourself has some benefits but doing it on a consistent basis as is often the case can become challenging. First, you need to enjoy the activity to be able to sustain energy for it. Secondly, you need to have the time for it because it is time-consuming. Thirdly, expertise and experience are vital if you are to do it right and proper. The fact remains that most homeowners can’t just keep up with the rigors of caring for a lawn no matter how dedicated they are initially. For most homeowners in, the best way out of this chore is by hiring a professional lawn care company in Texas. These lawn care services have the time, skills and experience, so the homeowner doesn’t have to care for the lawn. It’s simple wisdom to leave experts in the care of lawn to save you from stress. With a GoMow lawn care service engaged to handle your lawn, you no longer have to get tired, down and dirty to maintain your lawn yard. Would you love to have freer weekends? We have discussed in detail the 5 benefits of a professional lawn care service. If you are a Texas lawn owner, you would have noticed that a good number of different grass types exist. It takes a trained eye to be able to spot the differences at times. 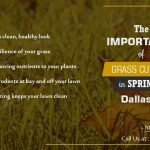 A Plano homeowner will have a better experience using a Plano lawn care service to provide adequate care for their lawn. Most lawn care services have more experience, time, and expertise than a typical lawn owner and will do a better job of it. To provide your lawn with the best care possible, you need to invest a lot of intensive physical effort. This can be very tiring especially when you are having a busy week or weekend. The stress of mowing isn’t something many lawn owners like as it comes with other risks. It could be health challenging for old homeowners who might not be in the best physical state. 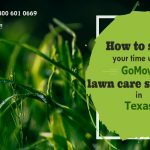 Hiring a GoMow Plano lawn care service will save you from a day of scorching sunshine, exhaustion, sore muscles, potential injuries, and boredom. 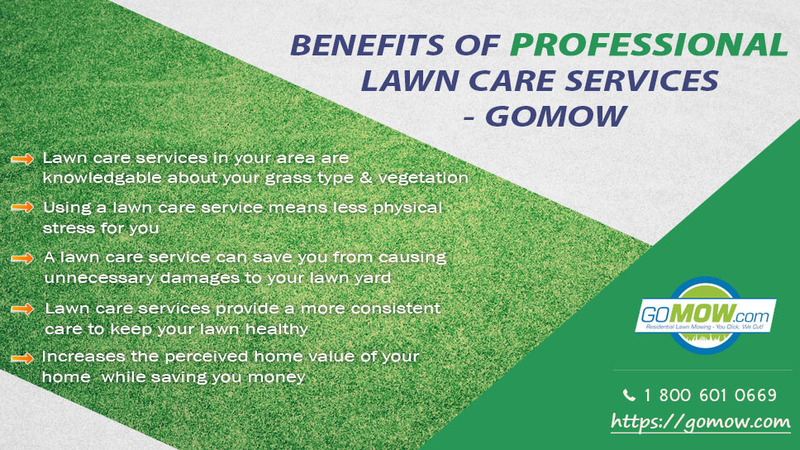 Why stress yourself so much when you can use one of the best lawn care services in Plano like GoMow Lawn Mowing Service, Texas. Restoring a damaged lawn yard is often expensive, as many homeowners have found it out the wrong way. A good number of lawn owners are not knowledgeable when it comes to adequate lawn care to maintain and grow their lawn yards. Not knowing enough about lawn care means you have to leave it to those who are best at delivering residential lawn mowing services in Texas. A wrong mowing practice can damage your lawn badly; similarly, poor water application can do the same. You may be applying the wrong fertilizer or using your equipment badly which can cause unnecessary damages on your lawn. For best results for your Plano lawn yard, using a lawn care service means you give little room to errors that can damage your lawn because these experts are very experienced at caring for lawns. By virtue of being professionals, lawn care services are more consistent at providing care for your lawn to keep it healthy. Depending on the type of service package you go for, your preferred Plano lawn care service has more time, experience and enthusiasm to provide quality care to your lawn. 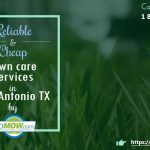 GoMow Lawn Mowing Services remains one of the best residential lawn mowing services in Texas to check out for your lawn care needs. A healthily-maintained lawn yard increases the perceived worth of the home which it is a part of simply because it looks great. If you should decide to sell your home at any point, a lush, beautiful lawn yard will certainly increase the value attached to your property thereby making you more money. This is usually the case when a professional lawn care service is in charge of your lawn yard care. It should also be taken into consideration that using these professional lawn care services also saves you money in the long run. Now think about actually purchasing all the equipment and other resources needed to provide care for your lawn then investing time and energy to do it yourself. Quite expensive when compared to hiring lawn care companies in Texas to do these same things for you. In addition, making mistakes on your lawn can also be expensive and cost you a bunch to correct them. Using lawn care experts saves you from wasting time, resources, and energy while improving the value of your home from its improved, healthy look. The benefits of hiring professionals far outweigh any misgivings that may come with it. You get to relax more, enjoy your days and weekends and get to have a beautiful, professionally-maintained lawn. Contact us today at GoMow Lawn Mowing Service, Texas for the best lawn care Service! You can click below to get a quick FREE QUOTE for lawn care service plans.